known as La Grande Mademoiselle, was the eldest daughter of Gaston d'Orléans, and his first wife Marie de Bourbon, Duchess of Montpensier. One of the greatest heiresses in history, she died unmarried and childless, leaving her vast fortune to her cousin, Philippe of France. We do know Duchess of Montpensier from book series Angelique well. Grande Mademoiselle met for the very first time with Angelique at the Kings Wedding in Saint Jean de Luz. Later, in Paris, she did try to help Angelique to free her husband, Joffrey de Peyrac. "Greatness of birth and the advantages bestowed by wealth [...] should provide all the elements of a happy life...yet there are many people who have had all these things and are not happy. The events of my own past would give me enough proof of this without looking for examples everywhere"
She is best remembered for her role in the Fronde. Mademoiselle was very close to her father Gaston, Duke of Orléans. Frequently involved in conspiracies against Louis XIII and his unpopular chief advisor, Cardinal Richelieu, he was often on bad terms with the court and banished on several occasions. After a string of proposals from various members of European ruling families, including Charles II of England, Afonso VI of Portugal, and Charles Emmanuel II of Savoy, she eventually fell in love with the courtier, Antoine Nompar de Caumont called Lauzun. Mademoiselle fell hopelessly in love with Lauzun. 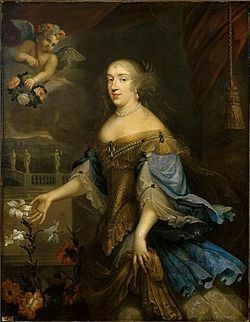 In December 1670, she was most senior female at the court (behind Madame Royale, the only legitimate daughter of Louis XIV) she asked Louis XIV's permission to marry Lauzun. Louis consented, to the astonishment of his court and much to the dislike of Queen Marie Thérèse, Monsieur and various members of the court. The Queen and Monsieur refused to sign the marriage contract.The date for the ceremony was set to occur at the Louvre on Sunday, 21 December 1670. 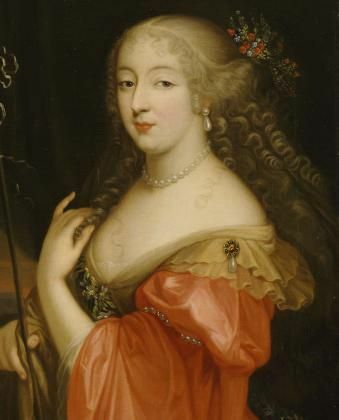 Lauzun even asked Louis's mistress Madame de Montespan to help convince the king to submit to the match. Mademoiselle was in high spirits later, stating that the days from 15 to 18 December 1670 were the happiest days of her life. She referred to Lauzun as "Monsieur le duc de Montpensier" to her friends. Actually she scandalised the court of France when she asked Louis XIV for permission to marry him, beacause as such a union was viewed as a mésalliance. he joy was not to last; under pressure from a disapproving court, Louis XIV reversed his decision, and the engagement was called off on 18 December stating that it would damage his reputation. Mademoiselle was asked to have an interview with the king and Madame de Montespan. The former informed her of his decision, to which she responded, "what cruelty..!" Louis replied that "kings must please the public" and ruined Mademoiselle's hopes of marriage on that "unhappy Thursday", as she later called it. Mademoiselle secluded herself in her apartments and did not reappear until the beginning of 1671, when she was informed of the arrest of Lauzun without an official reason released. The most Astonishing Thing - Madame de Sévigné writes about Grande Mademoiselle and duc de Lauzun. He naturally encouraged one of the greatest heiresses in Europe, and the wedding was fixed for December 21, 1670. Then, on the 18th, Louis sent for his cousin and forbade the marriage.